Throughout the course of the season, Colts.com will run a “Newcomer of the Week” following each regular season game. With the Colts having an influx of the newcomers this season here’s a look at the “Newcomer of the Week” from Houston. This week’s “Newcomer of the Week” is running back Trent Richardson. Just prior to the Cincinnati game, Trent Richardson announced that he was feeling the best he had felt since arriving to Indianapolis in the middle of September. Richardson’s stats over the past two weeks would certainly back up his statement. On Sunday, Richardson had 23 touches for 102 yards, giving him 34 touches for 190 yards over the last two weeks. Richardson’s effort on Sunday was vital considering he played 46 offensive snaps (out of a possible 70) once Donald Brown exited with a “stinger”. “I come out and train and practice hard and make sure I do everything I can to be in that position for whenever they call on my number, I’m ready,” Richardson said after the 25-3 victory. Richardson scored on a nine-yard shovel pass midway through the second quarter and caught a total of four passes for 38 yards. His season long rush of 22 yards came in the second half as Richardson received all of the running back load once Brown went down (before Tashard Choice came in to run out the clock). “Trent’s been practicing extremely well. Trending in the right direction, obviously. Feeling more comfortable with the offense, so you’re going to see him do nothing but take off from here,” Chuck Pagano said. –Outside linebacker Erik Walden had three tackles and a 10-yard sack of Case Keenum on Sunday. –Outside linebacker Bjoern Werner had his first career full sack in the NFL with a seven-yard takedown of Keenum in the fourth quarter. 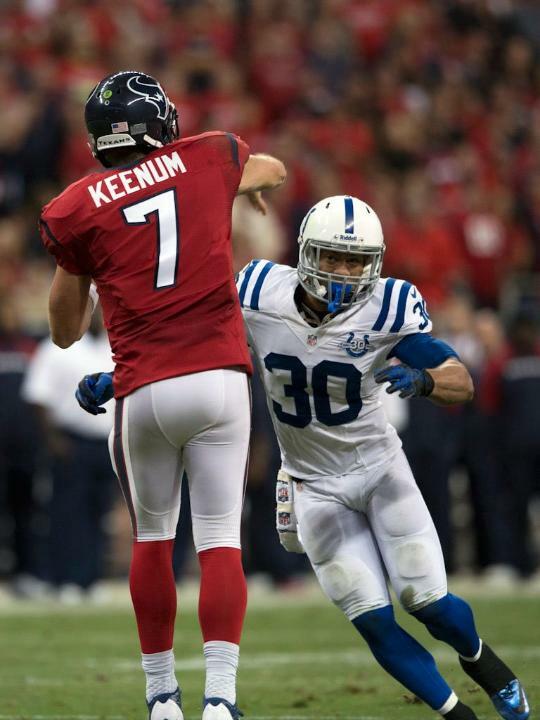 –Safety LaRon Landry was a part of a terrific safety duo on Sunday and led the Colts with nine tackles (eight solo). Throughout the course of the season, Colts.com will run a “Newcomer of the Week” following each regular season game. With the Colts having an influx of the newcomers this season here’s a look at the “Newcomer of the Week” from Cincinnati. This week’s “Newcomer of the Week” is wide receiver Da’Rick Rogers. When the Colts offense came to the line of scrimmage with just over 10 minutes remaining in the third quarter, the unit was still looking for their first third-down conversion on Sunday. The offense was also searching for a playmaker. Da’Rick Rogers achieved the first mark and might have gone a long way in filling the second. On a third-and-five from the Indianapolis 31-yard line, Rogers caught a quick slant from Andrew Luck before breaking two tackles and rumbling 69 yards for his first career NFL touchdown. Rogers became the fourth rookie and the first undrafted rookie in the NFL this year to have a 100-yard receiving day and two touchdowns. In a 42-28 loss, some solace came with the performances of Rogers and Brazill for a receiving corps that needs those efforts more consistently down the stretch. “It’s a group effort,” Rogers said. “We come in early. We stay late. We try and get onto the same page with Andrew ever since Reggie Wayne got hurt. We are just trying to come together as an offense. “We’ve got playmakers all over the field. I’m just trying to get in there and show my talent and show that I be a playmaker as well. –Outside linebacker Daniel Adongo played a total of 22 special teams snaps in his NFL debut and fell on a bouncing Bengals kickoff. –Running back Trent Richardson had 11 touches for 88 yards on Sunday and was particularly effective in the receiving department with five catches for 68 yards. –Safety LaRon Landry finished Sunday with nine tackles and one pass deflection. This week’s “Newcomer of the Week” is inside linebacker Kelvin Sheppard. Considering the amount of snaps linebacker Kelvin Sheppard played on Sunday his production was quite impressive. The third-year linebacker had five tackles in 21 defensive snaps and was a major reason why the Colts defense put together its best effort in over a month. “Really proud of the defense playing the way they did,” head coach Chuck Pagano said after the 22-14 win. “They were asked time and time and time again to go out there and make stops and got off the field against a team that came in doing a really good job on third down. Sheppard has seen a variety of playing time in his first season with the Colts and has accounted for 11 tackles the last two weeks. The Colts acquired Sheppard via trade for outside linebacker Jerry Hughes in late April. At 256 pounds, Sheppard gives the Colts a physical presence at inside linebacker that is critical in stopping the opponents rushing attack. That was once again the case on Sunday as the Colts held Chris Johnson to just 3.8 yards per carry with his longest rushing being just nine yards. –Safety LaRon Landry was roaming the middle of the field all afternoon Sunday. He recorded four tackles, including a four-yard loss on a screen pass. –Outside linebacker Erik Walden returned from his one game suspension and played all 75 defensive snaps. Walden had four tackles and one pass deflection. –Inside Linebacker Josh McNary made his NFL debut on Sunday and played a total 21 snaps. In McNary’s three defensive snaps, the Army product recorded a quarterback hurry. This week’s “Newcomer of the Week” goes to LaRon Landry for what the new safety has done since returning to the lineup. Landry was second on the team with nine tackles on Sunday night. Despite missing half of the Colts eight games, Landry is third on the team with 41 tackles. Having Landry alongside Antoine Bethea gives the Colts a physical presence in a player that is always going full speed. Landry had some crucial open field tackles on Sunday night and helped the Colts defense bounce back from a difficult first half. Early on it was Landry combining on a third-and-one run stop of Houston running back Ben Tate. That stop was followed up by a failed fourth-and-one and the Texans missing a chance to go up 14-0 in the first five minutes of the game. For a Colts secondary that was missing three contributors on Sunday night, Landry roaming all over the field has provided some play making ability to the backend of the defense. –Running back Trent Richardson had a pair of screen passes that came at critical times. Richardson had nine and 24-yard fourth quarter grabs that both led to T.Y. Hilton touchdowns. –Outside linebacker Erik Walden continues to play at a high level and he had a pair of tackles for loss to go along with a 10-yard sack of Case Keenum. The sack forced a Texans field goal attempt. –Nose tackle Aubrayo Franklin had three tackles which is pretty high for a nose tackle. Franklin was apart of the middle of the Colts defense that stuffed the Texans on a pair of short yardage situations early in the first quarter with Houston in Indianapolis territory. While many Colts players were recovering on Tuesday from an early morning return from the west coast, LaRon Landry was busy in the weight room. Landry, who was a full participant in Wednesday’s practice, hasn’t been happy to miss the past four games after he led the Colts with 26 tackles in the first two contests of 2013. “It’s kind of hard to watch and be on the side of the game that you are passionate about, a game that you love,” Landry told “Voice of the Colts” Bob Lamey. The question comes up weekly in Chuck Pagano’s press conferences and Landry himself has the same inquiries. And hopefully a possible answer on Sunday night? Ever since Landry stepped onto the field for his first practice in a Colts uniform, his energy was evident. It’s that passion that Colts fans are hoping to see very soon and Landry holds those same standards. The Colts players were off on Tuesday before preparations for Miami picks up the pace on Wednesday. Today’s news looks at the Colts defense and the hard-hitting safety that is LaRon Landry. Take a look below at the top pieces from Wednesday, September 11th. Holder wrote a good piece on the unique scheme that the Colts defense faced on Sunday afternoon. How should the Colts defense be judged after Week One? I went back and examined some of Pryor’s longer runs of the day. What I found is that his best runs were simple sandlot scrambles, not the designed, new-school, read-option stuff you surely are becoming quite familiar with. In fact, the Colts did a half-decent job against the standard read-option plays. Pryor got 13 yards on one such play in the second quarter, but on most such calls, he was held relatively in check. Two 9-yard gains on read-options are the only others that caught my eye. The 29-yard run Pryor had in the second quarter? That was pure improvisation. He looked downfield, didn’t like what he saw, and took off. There was a 26-yard run by Pryor in the fourth quarter which is a little gray. It looks like a pure naked bootleg, with Pryor faking the handoff, then rolling to his right. It looks to me like he never even considered throwing the football, though he did have a receiver or two running routes. Hard to say what the original intent of the play caller was there. But in either case, it was not a traditional read-option play. Here’s the point: This is not something the Colts are going to see often. Most coaches, even in today’s NFL, aren’t going to expose their quarterbacks to contact with that much regularity. And most quarterbacks, even the mobile ones, are going to be expected to stay in the pocket and go through progressions more often than not. When coaches mix in a read-option play here and there, there are hard-and-fast rules that defenders have to follow to limit the damage. Kravitz had a pretty humorous column detailing the impressive physique of Colts safety LaRon Landry. I had a simple request for Indianapolis Colts safety LaRon Landry. He doubled over in laughter. See, Landry would make Adonis blush. He makes former coach safety Bob Sanders look like the “before” picture in one of those before-and-after Charles Atlas ads. His biceps look like several pythons fornicating (not that I have any idea how exactly pythons fornicate). During his Washington Redskins days, his teammates called him “Iron Man.” In his locker, he keeps a Red Hulk action figure who engages in different muscular poses, depending on how strong Landry is feeling that day. 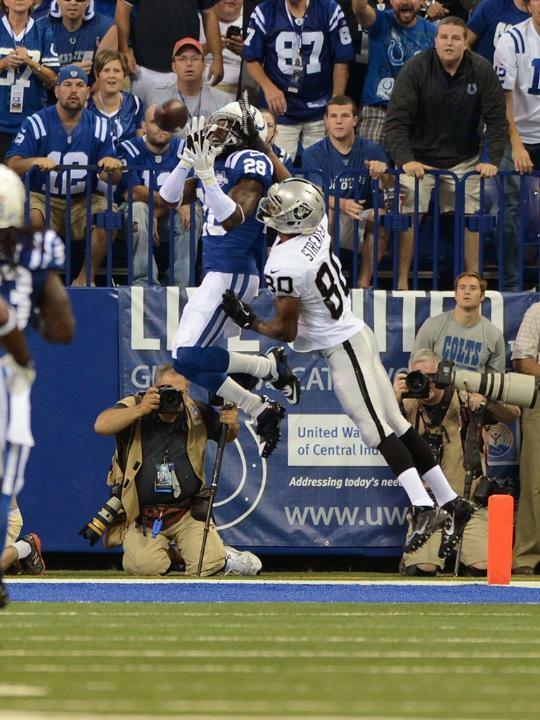 The Colts news on Monday looked back on their 21-17 victory over the Oakland Raiders. The highlights were Andrew Luck’s running ability, the pregame coin toss and the play of LaRon Landry. Take a look below at the top pieces from Tuesday, September 10th. The talk around the Indiana Farm Bureau Football Center on Monday was the running ability of Andrew Luck. While the quarterback doesn’t agree with a “running” label many might argue with that personal evalution. But does he consider himself a viable read-option quarterback? Rather, he’s a pro-style, dropback quarterback who can do damage with his legs. He ran a 4.59 40 at the 2012 NFL Scouting Combine, matching Cam Newton from the previous year. Luck isn’t hesitant to tuck the football and run, but it’s not his first, second or even third option. “Situationally, it depends,” he said. “I want to get the ball out of my hands 99.99 percent of the time. We’ve got great receivers on this team. We’ve got great tight ends. We’ve got running backs that are hard-nosed, (that can) make guys miss. The pregame coin toss might not get a ton of attention from fans each week but Chuck Pagano was asked about his choice to defer on Sunday. For so long, the Indianapolis Colts would elect to receive the ball when they won the toss because they had Peyton Manning at quarterback. Manning often led the Colts on opening-scoring drives, putting pressure on the opponent to counter the score. Those days are numbered as long as Chuck Pagano is the coach. Pagano, a defensive-minded coach, prefers to defer so that his defense is on the field first and the Colts get the ball at the start of the second half. LaRon Landry had played just two and a half quarters during the 2013 preseason. However, any perceived rust for the new Colts safety was quickly put to rest on Sunday. 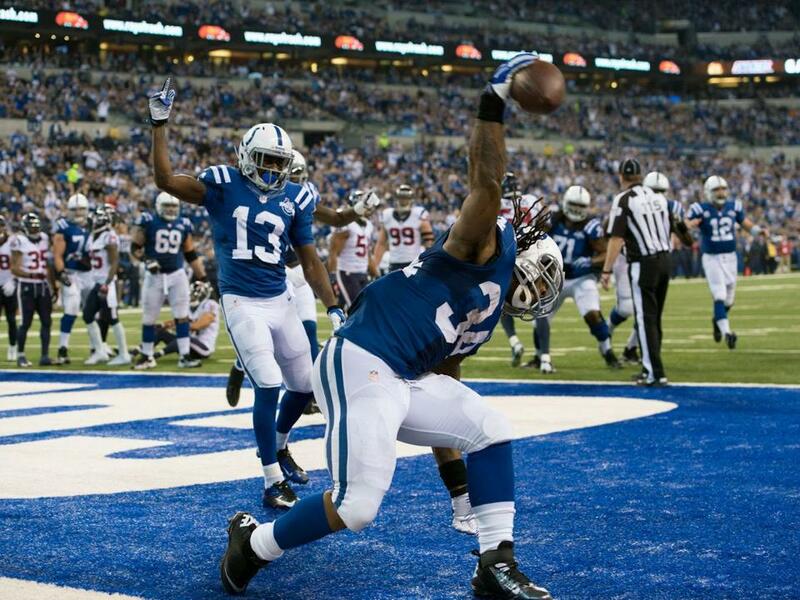 That blur you saw flying across your television screen Sunday was Colts safety LaRon Landry. In his first regular-season game since joining the team as a free agent from the Jets, Landry seemingly was in on every tackle Sunday. He finished with 15 stops, 10 of them solo. 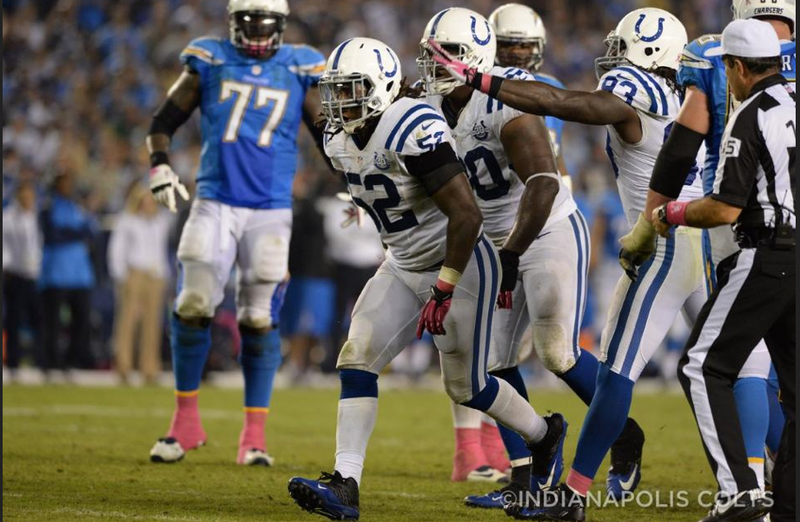 In doing so, he brought a demeanor the Colts defense has needed. It’s the same ball-hawking skills that have been on display since OTAs. Greg Toler just decided to show a few more people that ability on Sunday afternoon. With the Raiders into Colts territory on the game’s first possession, Toler ended any scoring opportunity with an interception in the end zone. On the interception, Toler had tremendous coverage inside of Raiders wide receiver Rod Streater. “I was fortunate enough to get a beat on the ball coming down. Our defensive line and linebackers, hats off to those guys for getting pressure on Terrelle (Pryor) and he just kind of lofted it up and I found the ball early and was able to make a play for my guys,” Toler, who received a game ball, said following the Colts 21-17 victory. Toler also had a pair of pass deflections on Sunday and was apart of a Colts secondary who continually kept plays alive for well over five and six seconds. -Safety LaRon Landry led the Colts defense with 15 tackles (10 solo). -Wide Receiver Darrius Heyward-Bey had three catches for 33 yards. -Inside linebacker Kelvin Sheppard started for the injured Pat Angerer and finished fourth on the team with six tackles.